Earlier this year, during a webinar I facilitated with the NEA Foundation on how to gain buy-in for global learning with outstanding teachers from across the U.S., one very engaged educator cited (with frustration) the push back she’s getting from colleagues. She’s hearing that global and cultural competence seem like “the icing on the cake, but not the cake.” And leadership seems to reinforce that: if their energy and financial resources are spent largely on assessment, technology, curricular rubrics, discipline and the like, then doesn’t the other stuff feel more like icing on the cake? Is this the cake or the icing on the cake?? What is the cake? How much does your teaching practice and classroom environment reflect the stated mission, vision, values of your school? Are you teaching students or teaching content? In other words: What does educating humans mean to you (vs. imparting information they could have learned from a computer)? What is the most important to you to have your students achieve while you have them in your class? Determine that and work backwards to fill in the details. When it comes to your own vision and values, what do YOU stand for? What are you willing to take a stand for in your classroom, or vis-a-vis your students? 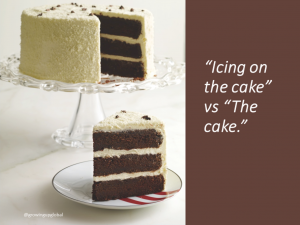 After sharing this question last week with educators at international schools, I’ve received comments and feedback from teachers in varied environments who then asked their colleagues: What is the cake? The simple act of asking a driving question and inviting reflection is helping teams step back to remember what is most important and what drives them. For those who believe global and cultural competence are vital, this question helps them make the case. As has been argued vehemently for decades, global and cultural competence are vital for today’s students. Just take a look at the headlines highlighting crisis, division, and rapid change that don’t respect borders, in order to start answering why. We also have long established that we are preparing students for jobs that don’t exist, using technologies that haven’t been invented to solve problems we have never heard of. Today’s students will need to solve these problems with and for people who don’t look like them, or live close by, or speak the same language, or live by the same belief systems. Walls won’t help them. I believe our children will find many ways to solve an algebra problem, enhance their reading level, finish a chemistry lab or learn to code. But if they learn these in a bubble, without having developed the knowledge, skills and dispositions that come with qualities like active empathy and the ability to recognize diverse perspectives, the effectiveness of all that “hard” learning will be limited. Recognizing the human skills at the core of global and cultural competence helps create the psychological safety and other mindsets needed for innovation and for learning to stick. If this isn’t the cake, what is? !